Find the cause of a rat infestation for a Telvanni enchanter. Hear Latest Rumors about a rat problem. Talk to Audenian Valius at the Telvanni Enchanter shop in the Telvanni Canton. Kill the two rats in his bedroom. Kill ten rats in the Underworks. Return to Audenian for a reward of a Grand Soul Gem. Ask around for the latest rumors in Vivec's Telvanni Canton and you'll hear about a rat problem that Audenian Valius has been having on the Waistworks level in his enchanter shop. Talk to Audenian Valius and you'll find that he wants you to kill some rats (which are actually Telvanni sewer rats) and that he's got two holed up in his bedroom. After dispatching the two rats in his shop, he claims that he wanted ALL of the rats killed and points out that he believes they are crawling up from the Underworks (sewers) of the Canton. Investigate the Telvanni Underworks to find 10 more rats that need to be killed. The rats should not appear before the quest is active, and you should receive a journal update when you kill the last one. Some of the rats may be in the water, even possibly swimming along the bottom and never coming up to attack you. Return to Audenian for a reward of a Grand Soul Gem. It is necessary that you hear the related rumor first, otherwise Audenian will not mention his problem. Accepting this quest does not always generate all 10 rats needed to complete the quest. The console command PlaceAtPC rat_telvanni_unique 1 0 0 0 can be used to place additional Telvanni Sewer Rats into the game world. 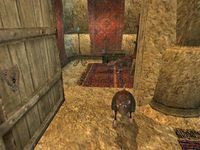 10 I have heard rumors in Vivec of a merchant with a rat infestation problem. Apparently, Audenian Valius, a Telvanni enchanter, has been overrun by rats in recent weeks. 20 I have spoken to Audenian Valius about his rat infestation problem. He'd like me to clean out the rats that have been infesting his store. 25 I've agreed to help get rid of the rats that are bothering Audenian Valius. 26 Finishes quest I've decided not to bother with Audenian Velius' rat problem. 30 It appears now that Audenian Valius didn't just want me to kill the rats in his store, but also the nest of them that have been coming up from the Underworks. 35 I believe I have killed all of the rats plaguing Audenian Valius. 40 Finishes quest I have killed the nest of rats in the Underworks, and returned to Audenian Valius. He was grateful for my help, and rewarded me with a valuable soul gem.